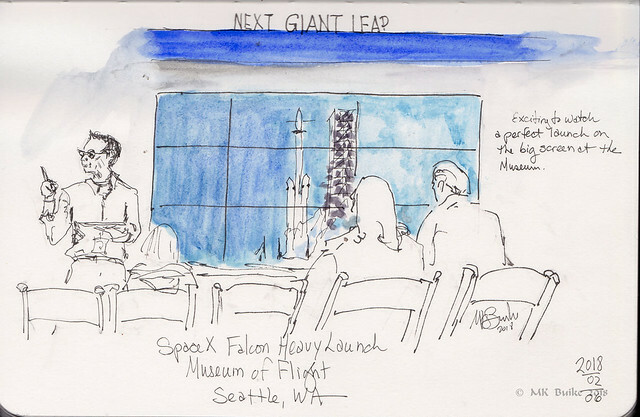 The Museum of Flight hosted a launch event. 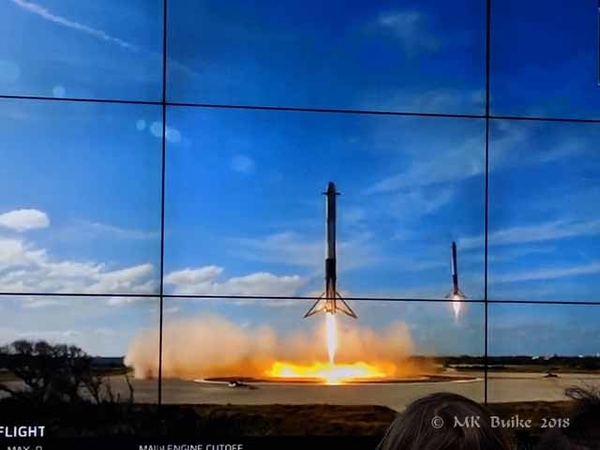 Space X scheduled the first launch of the Falcon Heavy rocket for 10:30 PST today. However, when I arrived, I learned the lift off was delayed until 12:30. I left to do an errand. Once back, I realized I still had another hour to wait as launch was further delayed. 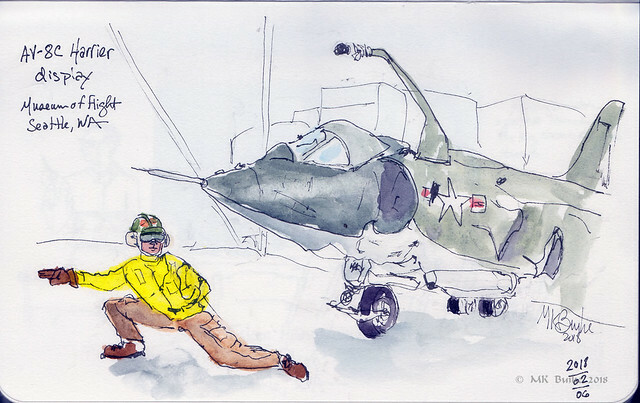 I went out to the Aviation Pavilion to sketch this scene with the Harrier. The figure is a statue of an Aircraft Handling Officer, responsible for managing aircraft movement on the flight deck of an aircraft carrier. This is the AV-8C Harrier. It was quite chilly out in the "Av Pav" so I was glad to be back inside the warmth of the Space Gallery where a small crowd had gathered to watch the launch. This really is an historic event. The launch pad used was Complex 39A from which Apollo 11 launched in 1969 as well as other Apollo and Space Shuttle missions. This is the most powerful operational rocket in the world by a factor of two. Only the Saturn V moon rocket was more powerful. It last flew in 1973. This is a "demonstration mission". In place of a payload, Elon Musk's red Tesla was carried into space. If all goes to plan, it will travel in an Earth-Mars orbit around the sun! What an experience! The launch was perfect! Then the two side cores/boosters landed perfectly back on the pad at Kennedy. What a sight! Unfortunately, the center core didn't make it to the drone ship where it was planned to land as well. My friend, Carol, traveled to Florida to watch the launch in person. She told me via message that the central core ran out of fuel. Of course, I commemorated the experience with a sketch, done while waiting for the launch.